Instead of meticulously picking one high-paying stock after another — in hopes of building a secure dividend stream — how about simply buying a fund or two that does everything for you? After all, you’ve already made the correct asset allocation in choosing dividend stocks – which outperform non-payers by a wide margin. There are money managers who can perform quite well with this mandate. Some of them run “multi-asset” funds, which don’t get much press. That’s too bad, because the best yield 6% or more and focus on cash-generating assets such as real estate investment trusts (REITs), master limited partnerships (MLPs) and junk bonds. Let’s review three intriguing options today. However, the MLTI doesn’t get its exposure in a uniform way across the board. MLTI’s access to BDCs, mREITs, REITs and U.S.-listed equities come via individual stocks, with a pretty broad range – from utility Hawaiian Electric Industries, Inc. (HE) to real estate stock City Office REIT Inc (CIO) to global investment firm KKR & Co. L.P. (KKR) to retailer Gap Inc (GPS). However, its bond, preferred stock and international equity exposure comes from an array of exchange-traded funds, including the SPDR Wells Fargo Preferred Stock ETF (PSK), SPDR S&P Emerging Markets Dividend ETF (EDIV) and the VanEck Vectors JPMorgan EM Local Currency Bond ETF (EMLC). But something important to note: MLTI doesn’t hold any of these things. In fact, MLTI doesn’t hold anything. That’s because it’s an exchange-traded note. In essence, ETNs are simply debt offerings, but instead of delivering regular interest payments, they are used to pay out the returns of an index. This means that in addition to the risks of the index itself, there’s also credit risk if the issuer – here, Credit Suisse Group AG (ADR) (CS) – suffers from credit rating declines. Still, the returns are very much real, and MLTI pays out a monthly coupon that yields north of 6% annually. 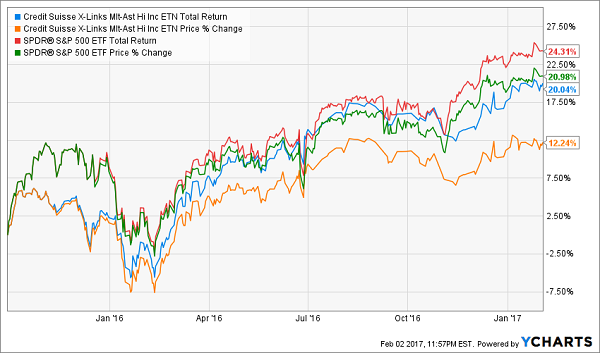 MLTI has been around for a little more than a year, and while its performance in that time has been great, at about 20%, it actually trails the 24% gains of the rip-roaring S&P 500. In essence, that dividend has been masking some serious underperformance on the price side of things. As the name implies, the Arrow Dow Jones Global Yield ETF (GYLD) takes a more international view of the income space. Still, you’re not completely abandoning U.S. exposure. The GYLD has a 40% weighting to American equities and debt, versus about 70% for the MLTI. And the international diversification is pretty smoothed out, with Turkey the top ex-U.S. geographical weight at just 5.6%. But similar to MLTI, the GYLD targets pretty balanced distribution across several assets. It equal-weights five categories at 20% apiece: global equity, global real estate, global sovereign debt, global corporate debt and global alternatives – preferreds, MLPs and Canadian royalty trusts. Here, though, the fund holds everything it’s supposed to track, and it does so through individual issues – both equity and debt. And there’s extraordinarily little single-stock risk, with Stonemor Partners LP (STON), Capital Product Partners (CPLP) and Sandridge Permian Trust (PER) among the top holdings at just a little more than 1% of assets. The global edge gives GYLD a little more yield power than MLTI, and a performance edge. GYLD has provided the stronger total return over the past year, up 29% to the MLTI’s 22%. However, the past few years tells a familiar story: One where international investments have lagged their U.S. brethren. The upside? Dividends have turned a -24% price return into a nearly 6% total return over the past five years. The downside? Well … GYLD has a total return of 6% over the past five years. Last, and certainly not least, is the YieldShares High Income ETF (YYY), which provides the last twist among our multi-asset funds: All of its holdings are closed-end funds. Closed-end funds are similar to exchange-traded funds in that they’re pools of various holdings, but they trade on an exchange. 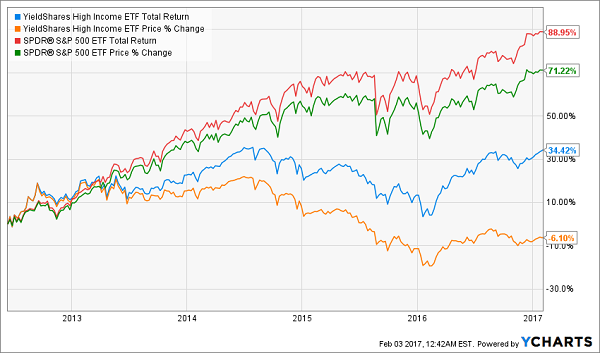 But unlike ETFs, CEFs have a fixed number of shares, so they tend to trade around slight premiums or discounts to their net asset values. But the reason why YYY focuses on CEFs is because of their high-yield nature. Many CEFs utilize leverage to buy additional securities; in fact, Miracle Mile Partners founding partner Brock Moseley tells Investor’s Business Daily, “The average CEF has almost 33% in leverage.” This essentially gives investors extra exposure, which is great for additional yield and capturing upside, but it also magnifies losses. YYY tracks an index of 30 CEFs that provides a 75%-25% debt-equity split, with about 80% of the fund invested in U.S. assets. Equity naturally leans toward real estate, at 18%, but financial services, tech and utilities also sport double-digit weightings. Three-quarters of YYY’s debt is corporate, with another 11% in government bonds. YYY still is somewhat disappointing over the past five years, boasting a total return that’s less than half of the S&P 500, with dividends covering for a negative price return. But it’s clear that a heavier emphasis on U.S. exposure has been key to better performance than GYLD. 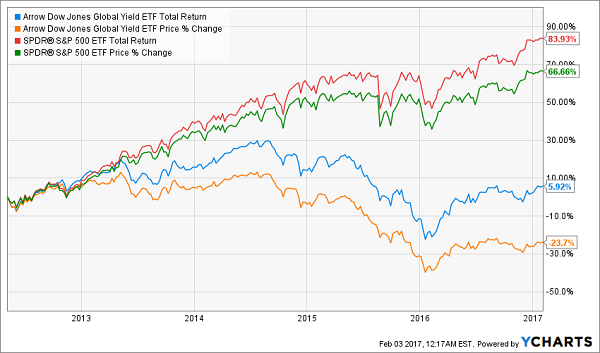 These closed-end funds all offer big headline yield, thanks to their exposure across the standard bearers of the high-yield world: REITs, BDCs, MLPs … you name it. But they’ve spread themselves too thin, and too many weaker holdings are drowning out the winners. If you want your retirement portfolio to generate meaningful returns down the long haul, you need a more tactical, focused approach that offers not just mouth-watering yields, but attractive capital gains down the road too. And as 2017 is starting to prove, all-weather protection is awfully important, too! Market euphoria has turned into market jitters as President Donald Trump churns out executive orders at a breathtaking pace, leaving analysts scrambling to decipher the consequences. Meanwhile, the Federal Reserve could raise rates three times this year, or maybe it’ll stick to just one like it did in 2015 and 2016. That’s why every income play you own needs to be bulletproof right now – like the stocks in my free “The Best 7% Dividends for 2017” report. My latest research has unearthed three high-yield picks that yield 7%, 8% … even double digits! And each one of them offers one of the most important virtues of any 2017 stock pick: defense! These picks will rumble right through 2017, regardless of what the Fed does, and regardless of President Trump’s next tweet. That means the only thing you have to worry about is how you’re going to enjoy your income. That’s because each of these high-dividend picks offer 12% to 38% price upside. That means you’re not just collecting dividends while maintaining your nest egg – you’re growing your funds in retirement! Article printed from InvestorPlace Media, https://investorplace.com/2017/02/3-diversified-funds-paying-up-to-9-5/.